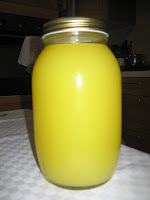 I'm so happy to let you know that my experiment with Limoncello has been successfully completed. It looks really great (the colour, I mean), we'll see about the taste. For now it's in the freezer, and I think we're supposed to wait a little bit before tasting it. It all started almost two months ago in a forum on Bakespace, somehow Limocello came up in a conversation, and I think a few days later, Shane was making it. Well, only a day or two later I was at the local supermarket, wondering if I could find all the ingredients (95% alcohol, good lemons) - and to my surprise, I did. I found everything, and, like a little child, grabbed everything and hurried home to peel the zest off my beautiful Sicilian lemons. They were twice as expensive as the "normal" lemons, but I think they were worth every cent. Don't you think? Just look at them! They were really big and had such a thick skin that it was a piece of cake peeling all the zest (and the important thing is not to take any pith as that would add bitterness to limoncello). 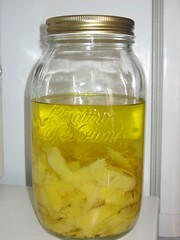 I peeled all the zest and placed it in a large jar with alcohol. The alcohol drew all the essence from lemon zest in no time, but I left it in infusion for almost 40 days anyway (actually I wanted to proceed after 30 days, but just had no time to dedicate to it, and I don't think there's any harm in leaving it longer than that). So, the other night I prepared the syrup: I put 1/2 liter of water and 1/2 kilo sugar in a sauce pan and warmed it up stirring constantly just till the sugar melted and the syrup became clear. I didn't bring it to boil. Then I left it to cool over night, and the next morning added lemon/alcohol infusion that I strained through a fine mesh. It was at this point that I realised that the amount of water should have been 1 liter (and I put only 1/2), so only one sip made me realise that my Limoncello was way to strong. I decided not to add any more sugar, but just water. The effect? See it for yourself. Addition of cold water makes Limoncello become a little blurry. I think that's cool. 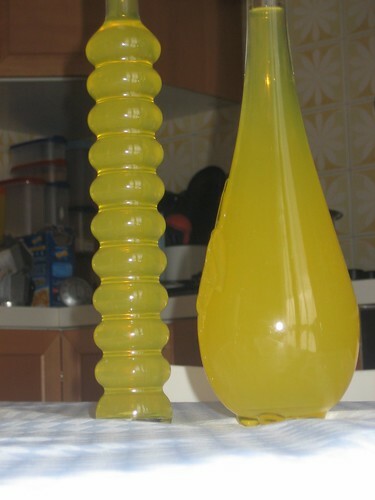 Well, now my Limoncello is ready to be drunk after dinner as a digestive, or added to fruit salads or strawberries, and why not, to my baking creations. 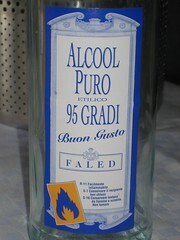 Remember to keep it in the freezer, even glasses should be cooled before serving Limoncello. 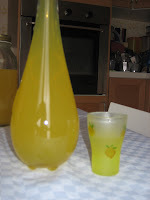 Limoncello je talijanski liker od limuna. Izvrstan za probavu nakon (obilnog) objeda ako ga pijete ledenog. Da, obavezno ga držati u zamrzivaču, i ne brinite neće se zamrznuti koristite li dobar 95% alkohol kao osnovicu. Dobro operite limune četkom pod mlazom tople vode. Skinite gornji dio kore limuna, narežite (izbjegavajte bijeli dio kore jer bi učinio liker gorkim) i stavite u staklenku s alkoholom. Ostavite na tamnom mjestu najmanje 15 dana (moj je ležao skoro 40, ali nije neophodno držati ga tako dugo). Nakon toga pripremite sirup: Stavite kuhati vodu i šećer. Miješajući, zagrijavajte dok se sav šećer ne otopi i sirup postane proziran, nije neophodno da provrije. Ostavite da se potpuno ohladi. Procijedite alkohol i odstranite korice. Pomiješajte alkohol i sirup pa sipajte u staklene boce. Dobro zatvorite i pričekajte barem još 15 dana prije kušanja. Možete odmah staviti boce u zamrzivač. Uživajte. Živjeli! P.S. Limoncello možete dodati u voćnu salatu ili jagodama, napraviti koktel s dodatkom pjenušca, ali također dodati u razne kreme i kolače. Beautiful! I can't wait to make this, you and Shane have inspired me to try it for myself :) thanks for posting! I'm tempted to try it too! I'll have to keep my eyes open for the alcohol. Love your bottle too! Absolutely delicious looking!!! Gorgeous bottles... I had to hide mine in a dark place, cause the color was fading from light exposure. It turned out great! I can't wait to hear how it tastes!